If the symbol of the 20th century insurgent was the AK-47 and a red banner, his 21st century counterpart may someday be recognized by the suicide belt and the “homemade tank”. Irregular fighters have always used light arms, civilian passenger vehicles and armor captured (or donated by) from conventional armies, but the ability to produce serviceable fighting armored cars is a new wrinkle. They could not stand up to an American or Russian tank company, of course, but they are not meant to do so. Most prevalent and evolved in Mexico’s narco-insurgency where cartels use these “monsters” converted from SUVs and various types of light and heavy trucks to battle one another and as “troop carriers” but these DIY armored vehicles have also appeared in the recent Libyan and ongoing Syrian civil wars. Where heavy anti-tank weapons, air power and real tanks are scarce, these narco-tanks are useful additions to irregular combat power and convey an intimidating image to lightly armed police and the public. government troops and other competing cartels. 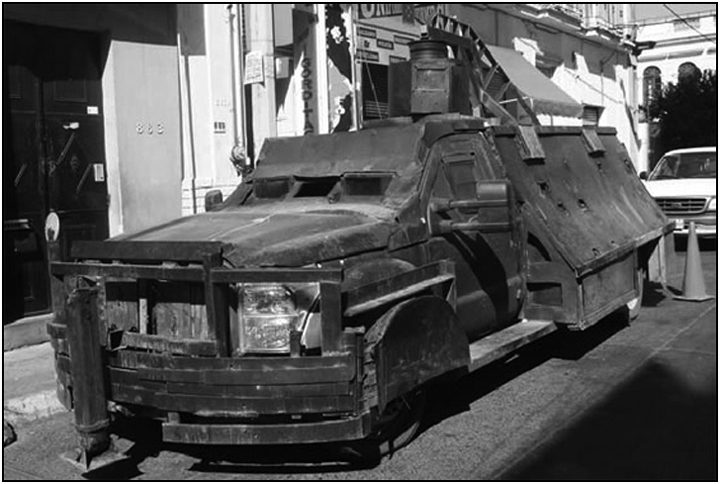 segment of the military technology utilized by violent non-state actors during this period: “narco armor” or, more accurately, improvised armored fighting vehicles (IAFV). exist per our research (see Picture Gallery). ….Given the apparent cessation of the fielding of narco armor since early 2012, quite possibly these vehicles have reached an evolutionary dead end, with more emphasis once again placed by the cartels on fielding more stealth-masked armored vehicles, such as armored SUVs, that better blend in with civilian cars and trucks so as to eluded identification and targeting by Mexican federal forces. Still, given the ever changing conflict waging in Mexico among the cartels and against the Mexican government, future resumption of IAFV employment will always remain a potential. During the Russian civil war (1917-1922), armored trains complete with heavy machine guns and artillery were used by both Bolshevik and White armies across the vast expanse of the Eurasian steppe and the armored train subsequently made spotty appearances in civil wars in China and Spain before fading away. This less likely to happen with homemade armor which is smaller and infinitely more mobile and can be created in a sufficiently large garage with time, elbow grease and a supply of scrap metal.